Yoga mat is becoming an essential item for modern yogis/yoginis. But, when did it become popular? I couldn’t identify the exact time. Originally, yoga mat might come from practical needs; prevention of slip or comfortability on lying down postures. Plus, the functions I will refer seem to be added consciously or unconsciously. 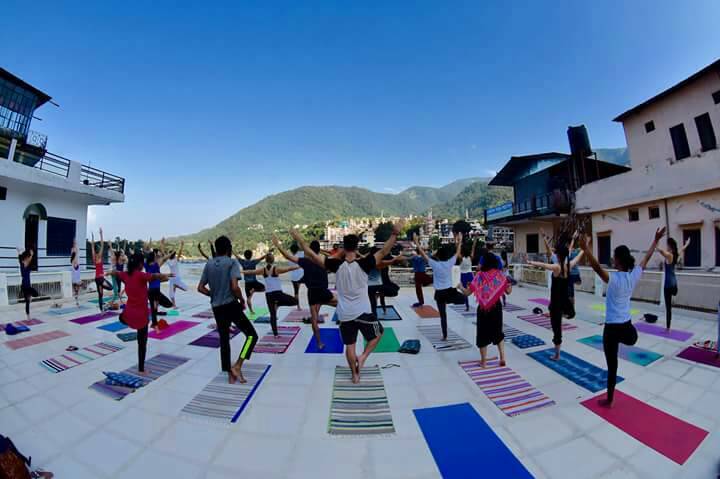 Modern yogis who practice while live in social life use yoga mat as a boundary between yoga and others. They set yoga mat for “sacred space”. They set the time they are on yoga mat for “sacred time”. The moment they stand on the mat, they are separated from gross and miscellaneous daily. They are in “yogic mode” during the time they are on it. Yoga mat, an artificial object, lies between yoga, the workings to be part of nature. This can be unnatural and impure. If I can, I want to use a mat made from natural materials so that it can return the earth. However, there is a merit due to the artificiality. Yoga mat, an artificial item, can exist without any change from yesterday to today, from today to tomorrow (at least from macro viewpoint). I, a social being, am a natural object which is always changing. Sometimes my feeling is mess when I stand on the mat. Yoga mat can bring me to usual state thanks to the “un-changeability”. 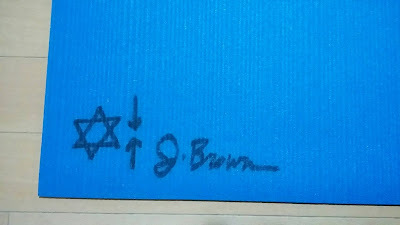 Incidentally, on my yoga mat there is a signature and message of my teacher J. Every time I stand on it, they remind me the power of yoga. Yoga mat functions as a boundary between self and others as well. This fact is clear in yoga classes with many people. Each of them secure “their own space” in the room. Even if you don’t care about this personal space, you may hesitate to step into others’ space. Some people may assert their personality by color or design of mats. If so, it is also an important function. By the way, the word “yoga” originally means “union”. The goal of yoga includes unity between yoga and others or between self and others. If so, I’d like to remove any boundaries we make unconsciously in the end. When the view of the world that is shown by these (above) words realizes, it may be the time when we don’t need yoga mat anymore. Hopefully, I will practice yoga as much as these distinctions are not problem, but it is difficult. In reality, we cannot help making these boundaries so that we can do specific practices. However, as long as we depend on the means; the use of yoga mat, and if I say more, asana, pranayama, and any kinds of techniques, we inevitably keep drawing boundaries. So, I cannot jump for joy without reserve. I’m feeling like always running with “training wheels” that I should discard someday. I don’t know if someday I don’t need yoga mat, poses, and breathing techniques anymore. If the time comes, it would be great. If not, it is also good. Yoga happens in the exercise named internal conflict; depending on many practice materials and at the same time trying to detach from them.